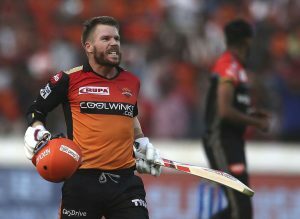 HYDERABAD – With their third straight opening century stand, with the highest ever opening partnership in IPL, and with rapid centuries of their own, Jonny Bairstow and David Warner consigned Royal Challengers Bangalore to their third straight loss. The 232 chase fell on Virat Kohli’s shoulder early in the innings, as Mohammed Nabi removed the top order, including the big scalp of AB de Villiers in the first four overs. Kohli crawled to 3 off nine in the Powerplay, but was out soon after. At one point, RCB slumped to 30 for 5, and it was game over. Sunrisers reached the IPL final last year without Warner. This year, without Kane Williamson, their captain and IPL 2018’s highest run-getter, they’ve put on three century opening stands. On Sunday, the demolition mantle was taken over by Bairstow, who scored his second T20 century and first in the IPL, off 52 balls. Kohli opted to bat because he expected the pitch to be slow in the first innings. He opened the bowling with Moeen Ali, and immediately saw Bairstow go after him. The second ball was swept for four to begin the boundary barrage. While Warner made room for deliveries that were outside off for punches and drives, and walked across to swat and nudge the others on the leg side, Bairstow mainly targeted the leg side right throughout. Barman returned to bowl the 16th, and conceded 20, the most expensive over of the innings. Bairstow fell soon after, but the damage had been done. Warner was on 70 off 42 balls then with 21 deliveries to go. From there, he struck Siraj and Umesh for sixes, and ran several singles and doubles even after he had batted through a hot Hyderabad afternoon. With a single on the last ball of the 19th over, he had six balls to face and seven to get to century. By steering a low full toss past short third man for four, Warner showed the original celebratory leap for his fourth IPL hundred. Siraj’s 0 for 38 were the most economical figures of the innings.